I've reached Season 2 of Love Boat. Somewhere around the end of Season 1, I asked myself, "Do none of these onboard romances fail? Wouldn't some failure not only be realistic but illustrate the sad side of love?" Agatha Christie tackled the sad, even tragic side of love in her Harley Quinn tales in which she argued that people are capable of killing and obsessing and mourning for love. Can't have Pride & Prejudice without Romeo & Juliet. Generally speaking, I find the sad, tragic side of love uninspiring. It's not that difficult to kill characters off and make the audience feel bad about it. Why bother? 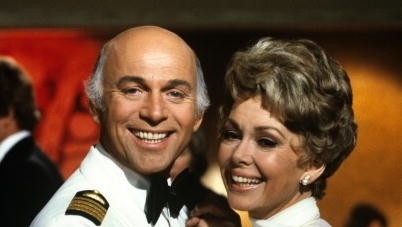 Still, if I'm a writer on The Love Boat, I'm going to be looking for whatever material I can, including some failed romances. Does anyone leave the boat not as a repaired/fixed/meant-to-be pair? Here it is: Season 2, "The 'Now' Marriage". And it's clever. Which is doubly impressive. A husband and wife come on board. The husband, Todd, is clearly going through a mid-life crisis. He wrote a book about open marriage: how having affairs will strengthen a marriage, draw the couple closer together. He has persuaded himself to believe in this idea and has persuaded his wife, Eleanor, to give him tacit permission to stray. She objects but his intellectual arguments override hers. Keep in mind: this is not a polyamorous relationship. This is a guy who wants to get something-something on the side and will use a theory to make it happen. He's no Professor Marston. For one, he doesn't want his wife to "experiment." And he doesn't intend to stay with the young grad student he picks up on board. He wants to live in the "now." Then go back to his regular life (until he wants to live in the "now" again, of course). As long as all parties agree, it sounds perfectly acceptable. What Todd's approach doesn't take into account is the law of unintended consequences. The grad student falls for him. When he condescendingly explains to her that their relationship was all about experiencing life in the present and she should let herself experience the pain as well, she responds, "You really believe all that junk you write. Well, I'll tell you something: in theory it's great. But when you're personally involved--it hurts." She then pours her drink in his lap. It's one thing to theorize; it's another to actually play with a person's emotions. In the meantime, Eleanor, the wife, becomes good friends with Captain Stubbins, who squires her about in a gentlemanly fashion. She starts out the voyage desperate and sad. She ends with a strong sense of her own worth, except her worth is tied to herself, not to waiting desperately for her husband to get over his experiments. In many episodes, this sequence would involve the interfering crew "fixing" the relationship. Captain Stubbins and Todd's wife would conspire to force Todd to face up to what he is losing. In fact, up until the very end, I thought the grad student might be a "plant." But no--the law of unintended consequences applies. "I knew once you overcame your fears, this experiment would work," Todd tells his wife at the end. "The point [of my affair] is it was a freeing experience, personal growth, something I can bring to enrich our marriage." "Todd," Eleanor responds. "There's no marriage to enrich." And she walks out. For good. No last minute reconciliation when the boat reaches home. She's gone. Unintended consequences. And a good point about why people need some underlying moral compass about relationships in the first place. Because people don't react according to a playbook or theory.